While Sudanese vote about the fate of South Sudan’s independence, one Sudan-born Texan supports the voting process from afar with a historic mobile-powered monitoring tool. Fareed Zein came to the United States from Sudan in 1981 to pursue a college education in computer science. One of the lucky ones, his family could afford his departure and his education, and he left before civil war rattled his homeland. Zein now spends his time–outside of his day job in oil and gas in Houston, Texas–directing the technology committee of the Sudan Institute for Research and Policy, a non-profit research organization started by his sister, a professor at a liberal arts college in Pennsylvania. “I believe technology is the equalizer,” Zein tells Fast Company. And so when he started digging around the Internet for ways to support last April’s elections and stumbled across Ushahidi, he immediately got in touch with them. 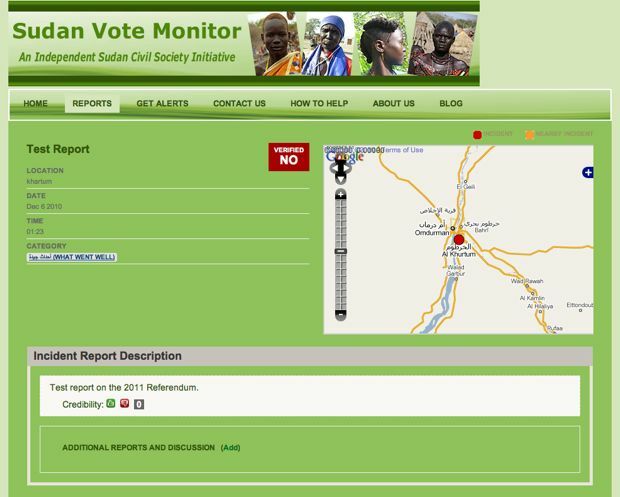 And while Ushahidi now provides the platform and technical support, Zein and his colleagues at the Sudan Institute are running their own show, in a service they call the Sudan Vote Monitor (SVM). SVM is Sudan’s first SMS-based voting monitor. The model is simple: People text a coded short message to SVM translating into either “violence,” “intimidation,” or any number of categories–and that information is then verified by SVM’s team, published to their site and made public for the world to see in both English and Arabic. Based in the U.S., the group works with local civil society partners on the ground in Sudan who have certified observers able to verify whether the reports are true or not. The viewers of the reports range from laypersons to government officials to Sudanese expatriates and activists around the world who, at their discretion, can use the information provided by SVM to notify persons in power, journalists, and international bodies or take action how they see fit. The upcoming Sudan referendum in January will decide whether South Sudan becomes an independent country or not. Already, Sudanese expatriates around the world have registered to vote at designated sites around the world. Tensions are high at the moment, as most observers have forecasted one of two outcomes from the referendum: a fresh civil war or the birth of an independent nation. “Replace” might sound like a stretch, but in places where governments fail to protect their citizens, tools such as SVM are all they have. The referendum is scheduled for January 9th and you can follow live reports on SVM’s website.